Has anyone out there tried multiple colour printing by cutting material into cm lengths and pre-loading the bowden tubes before starting a print? It's the UM3 I'm thinking trying this with. Obviously you'd have to match the material and keep an eye on the loading procedure, but that's pretty easy. Just wondering if it should work, are the bowdens tight enough to keep the material chunks inline. Anyway, just an idea, and just wondering. There's a company called Mosaic that does this in an automated way with a filament splicing machine controlled by the computer. While you print! It works pretty well. But it only works on 1.75mm filament. I think they tried it on 3mm filament and the color transition takes to long wasting tons of filament. So you would have to convert to 1.75mm filament if you bought this. 3dsolex could help you with that if you wrote them a nice letter (they could build and sell you 1.75mm cores to test out). Or I could if you lived in USA instead of UK. But converting a UMO or UM2 to 1.75 is quite easy. I once tried welding 2.85mm pieces manually. It works, but it is cumbersome. 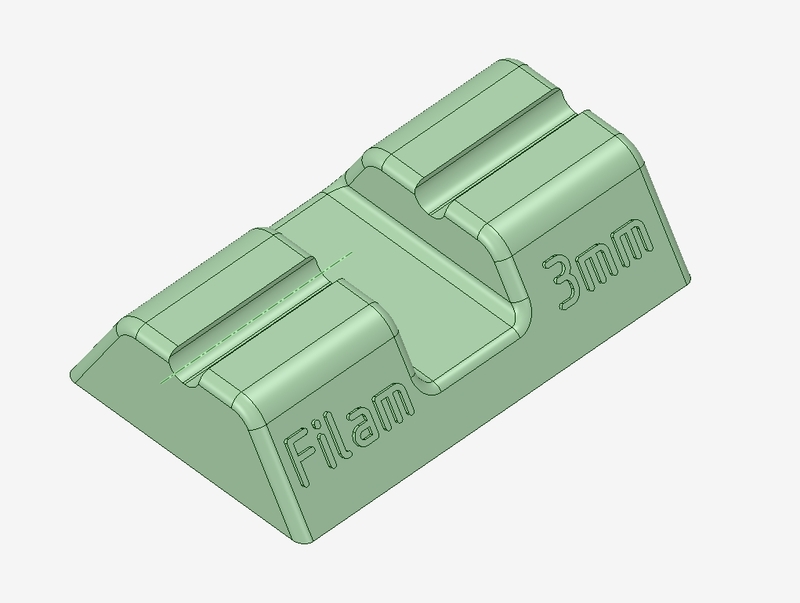 First, you need to design and print a sort of clamp or guide in which you can keep both ends of the filament aligned nicely. So that they match well while welding. Finally, cut away, sand, file or machine away the inevitable flanges. To minimise these flanges, don't melt too much filament, and don't push it together too hard. A hotter metal plate works better, as it takes less time to melt the filament's ends. It works: it gives a strong bond and feeds well. But the removing of the flanges is very time consuming, because the resulting diameter on that spot should be close to 2.85mm. Too thick or irregular, and it will get stuck. Too thin, and you get underextrusion. This is the "clamp" or guide I used. Clamping and sliding is done by pressing the filament down with my fingers. Very primitive, yes, but it was only ment for a quick test, not for production. For better results the filament should have been clamped over a longer distance, and with a top clamp too.